Wait, where's In the Scope? Well, this month we've substituted it for a special featurette on the upcoming TAW@WAR IX!!! The time has come again for the latest instalment of TAW@WAR! For this edition of the community-wide tournament, we will be playing the 2D platform fighter Brawlhalla. It's fairly similar to games such as Super Smash Bros, but with one big advantage: IT'S FREE! There are over 20 legends that you can choose from, each with their own unique weapons. The objective is to weaken your opponent by hitting them with attacks, and then finally blast them off of the edge of the screen to claim a point. Game-play is fast but highly tactical, and rewards timing and precision over blind button-bashing. Click on me to sign up for the 1v1 tournament. Click on me to sign up for the 2v2 tournament. Sign ups close on 23rd August. Click on this link to find the game in the Steam Store. How will the tournament be run? There will be two tournaments - a 1v1 tournament and a 2v2 tournament. You can enter both tournaments if you wish, as they will be run at different times. 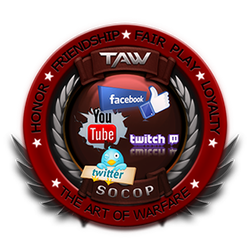 All members who participate in the TAW@WAR Tournament will receive a participation tab. The schedule will be revealed when sign-ups close on 23rd August. Who do I contact for more details?